There cheaters whose names should be nominated for getting the main prize at blackjack cheating but sometimes we want to give this prize not to any particular person but the whole organization. So, our main candidate for getting the prize is the Tran Organization. It definitely has a right to become the main blackjack cheating organization, which cheaters have been working through the whole country of the USA since 2002. So, the Tran Organization was formed in San Diego, California with the aim of cheating casinos all over the country. Their main “victims” were such card games as blackjack and mini-baccarat. The scheme was the following: the members of the organization bribed casino dealers or supervisors and, as a result, those dealers shuffled a card deck in a way it actually stayed non-shuffled. This situation gave players an opportunity to know everything about the order of cards in a deck. Well, a good way of dealer collusion indeed! This organization also used special computer devices which helped them to count cards and know when to stop. The person, who sat at the table, had a small microphone with him for having a chance to tell the other member of a team about what card combination he had. This person put the information into a computer program which counted cards and gave a variant of a possible bet on these cards. Such a system helped the Tran Organization to beat a lot of money out of casinos. Their winnings were counted by thousands of dollars. 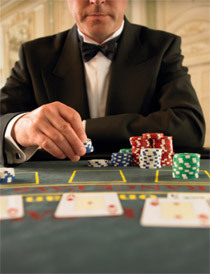 Fortunately for casinos, the members of this organization did not use anything for online blackjack cheating; otherwise, winnings would be counted not by thousands but millions of dollars. In 2009, Tai Khiem Tran and 13 other members of the Tran Organization were charged with conspiracy, stealing money of casinos and being the members of such an illegal enterprise. Actually, all there accusations against Tran and those 13 people were just suppositions without any evidences though their belonging to the Tran Organization is without any doubts. The government tries to prove it in order to avoid any misunderstandings.